If you're looking to do a little holiday shopping this weekend, why not buy some art? This Friday through Sunday, you can take in a group exhibition of fine art and craft makers, while sipping wine from Philipp's Fine Wine, all in the gorgeous setting of a newly restored flourmill on the Kinzig River in Erlensee. Three of my Postcards from the Taunus are in the exhibition. I'll be in town for the Opening of She is Herself, so it's nice timing! I plan to stop by this event on Sunday for a few hours before returning to England. Hope to see you there! Exhibition and Opening Reception for "She is Herself"
The power of art to heal! Am delighted that my work will hang in a new women's medical practice in Bad Soden, Germany. Opening reception: November 22 @3pm. I'll be there - please join me! One of the many things I love about my hometown of Washington, DC is the abundant free access to great art. On a recent trip to the US, my husband and I squeezed in one last exhibition at our favorite Smithsonian gallery, the Freer | Sackler, before heading to the airport. I didn't expect to be so mesmerized by the work - I mean, it's Whistler, so I knew it would be special - but I didn't anticipate what we saw among the etchings, watercolors and oil paintings in the exhibition. His oil Nocturnes are gorgeous. Scenes along the rainy, dreary, industrial 19th century Thames are transformed into abstract, minimalist, glowing color, highly influenced by Japanese woodcut prints. Fittingly, paintings and woodcuts by Kobayashi Kiyochika are juxtaposed in a separate exhibition on the same floor. Whistler's relationship to the Freer | Sackler was another surprise. Charles Freer met Whistler in 1890 when, on his first trip to London, he visited the artist's Chelsea studio. A long and fruitful friendship ensued, and with Whistler's encouragement and cooperation, Freer built the largest collection of his works in the world. Not bad to have a patron build a museum for your work! An American in London held special significance for my husband and me, as we prepare for a relocation to London this fall. With beauty like this to look forward to, it seems like a good move. Like bees to honey, people have been swarming to Kara Walker's jaw-dropping sugar sculpture, A Subtlety, at the Domino Sugar Factory in Brooklyn since May. My adventuresome mother and I buzzed up the Garden State Parkway from the Jersey Shore to NYC to check it out on my recent visit to the US. After a two-hour drive and one-hour wait, our efforts were worth it. Words and images don't do the installation justice. The work encompasses a 35' H x 75' L sugared sphinx, with the head of a kerchief-wearing mammy and body of an overly sexualized black woman. She is preceded by 15 five-foot molasses boys carrying baskets of unrefined sugar. Much has been written about the project, as well as the politics and controversy behind it. People have been taking (sadly) inappropriate selfies in front of body parts, and there's fuss about how the actual sugar for the project was sourced. But it's because of Walker's installation that people are talking about these things. The conversations that Mom and I had and overheard while waiting in line, inside the warehouse, and well after we left have been testament to the power of art to awaken and move each of us, if we allow ourselves to engage thoughtfully in something that makes us uncomfortable. For more Kara Walker, including selected works, articles and related artists, check out her dedicated Artsy.net page here. In the final decade of her long life, Louise Bourgeois was profoundly productive and powerful in her work as an artist. Here was a woman who boldly used her personal experiences, traumas and history to expose universal human truths. "Louise Bourgeois invites us to think again about creativity, relations between the sexes, youth and age, courage and fear, and the meaning and purpose of our lives. Louise Bourgeois is possibly the greatest of those four dominant female figures of the twentieth century, keeping company with Georgia O'Keeffe, Frida Kahlo and Agnes Martin. She belongs to the tradition of the true modern geniuses: Emily Dickinson, Gertrude Stein, Virginia Woolf and Susan Sontag." Two short films do an excellent job sharing the essence of the SNGMA exhibition, plus a concurrent exhibition of Bourgeois' drawings at The Fruit Market. The SNGMA video is an interview with Jerry Gorovoy, her long-time studio assistant and caregiver later on. The BBC's Secret Knowledge features a tour of the exhibitions with Tracey Emin, with whom she collaborated towards the end of her life. Bourgeois' work influenced me strongly when I started making art. My work is based on personal narrative, something I questioned then as being too...well, personal. After seeing the documentary The Spider and the Mistress, I stopped questioning myself and haven't looked back. Once again, Bourgeois is inspiring, at a time when I've questioned if I started "too late." Some of her most important work was made in her late nineties, thanks to apparent good health and support. To Emin's point, we have plenty of time. It's what we do with it that matters. I would also add, it's the relationships we carry with us that matter just as much. One fun benefit of being a printmaker is that you get to exchange original handmade art with other printmakers. Sometimes, whole groups of printmakers get together to swap prints – a real bonanza! And not only for the artists involved. A small number of complete print sets are sometimes made available to the public (see below). The Joint Portfolio Project is one such project in which I’m privileged to be involved. A total of 31 artists – 22 artists of the Providence Art Club in Rhode Island and nine artists of the Torpedo Factory Printmakers Inc. in Old Town Alexandria, Virginia – are busy completing 5x7 inch limited edition prints for the collection. Several exhibitions are scheduled for the project through 2015. A traveling exhibition, Joint Venture+, will showcase the 31 framed portfolio prints, plus additional pieces by each artist. There will be only 12 print portfolios for sale to the public, some of which have already sold. They are $550, which includes an attractive box to store the 31 signed, hand-pulled prints. You can find previews of the prints that will be included and more detailed information about exhibitions on The Joint Portfolio Project Facebook Page. You can reserve a portfolio or purchase one at the pre-publication price of $500 by calling Printmakers Inc. at 703-683-1342 or Providence Art Club at 401-331-1114 ext. 5. Telephone sales are accepted with a credit card. Every four years, Düsseldorf becomes the center of contemporary art in this part of Germany during the Quadriennale Düsseldorf. We caught a small slice of it this week during a short visit to the British Consulate in town for my husband's UK citizenship swearing-in ceremony (yes, I'm now married to a Brit!). This year's theme is Beyond Tomorrow. What we saw was compelling and provocative: Smart New World at the Kunsthalle Düsseldorf. Part performance art, part installation, the two-story exhibition space was transformed into a sensory commentary on digital technology, privacy, the NSA, and Big Data. I knew we were in for something different when we had to sign a declaration affirming our own inauthenticity before we could even purchase an entrance ticket. Admission Procedure, International Necronautical Society (INS). Kunsthalle Düsseldorf, 2014. The Quadriennale Düsseldorf runs through August 10th, featuring a total of thirteen museums, art venues and partner institutions. Catch it if you can! Something magic is happening this weekend throughout Europe: The European Days of Artistic Crafts. Every year, the first weekend in April is dedicated to the art of fine crafts in Europe. Porcelain, paper, lace, glass, perfume, chocolate, violins...you name it - if it's a material or tradition of fine craft, it's being shared and celebrated this weekend in Europe! I was lucky to be in Paris this past week to get a preview and small taste of what's happening across the continent. My friend and I spent the better part of a day wandering in and out of the ateliers along the Viaduc des Arts, a four-kilometer stretch of working studios. Tzuri Gueta creates patented silicon-infused lace that graces the runway designs of Givenchy, Lacroix, and Gaultier; Creanog has revived the dying arts of gold-stamping and embossing in packaging for Chanel; Maison Fey is a master guilder and upholsterer; Le Bonheur des Dames is heaven for all things embroidery; Atelier du Temps Passé restores paintings and objects d'art. The list goes on. cherry blossom time in DC! Peak Bloom, by Kelly O'Brien for microWave Project. Cherry blossoms made of paper, thread, glue and white mitsumata branches. Three years ago, I did my first paper sculpture installation for microWave Project at Art Whino's G40 street art Summit. It was the start of something that I had no idea I could do or would find so obsessively fun. Here we go again, this time like magic since I didn't have to actually do the installation myself. That task was left in the fine hands of Allison Nance and Mary Cook, the dynamic duo behind mWP. Very happy to have my work on site for what looks to be a wildly creative, unique-to-DC event, happening tomorrow night through April 20. A bunch of fine artists' work will be on hand to enjoy and purchase. Details below and lots of info here. Cherry Blossom Inspired art, 3 Bands, 3 DJ's and a night not to be forgotten! The sixth annual Cherry Blast: Art + Music Dance Party is Saturday, March 29 from 7:00pm-midnight at BLIND WHINO: SW Arts Club, a dedicated art space in Southwest Washington, DC (734 1st Street, SW). Tickets are $15 in advance for this 21-and-over event, and $20 at the door. The event annually sells out every year so get em before its too late! "The Path Itself Changed Her" by Kelly O'Brien (2014). Mixed media on paper, 70 x 50 cm. There's a story behind many of the pieces that I make. During the month of February while new work for my solo exhibition hangs at Galerie Uhn, I'm sharing brief backstories in a series of blog posts. The Path Itself Changed Her is a mixed media print, part of the Postcards from the Edge: Taunus series. Crossing paths with chickens, cows, sheep and horses is an everyday experience living in the Taunus. We have what we call the “chicken loop” as one of the routes we take with our dog Astro. He used to get so excited when we encountered various farm animals along the way. Now he takes them in stride. "You Lead, I'll Follow" by Kelly O'Brien (2014). Mixed media on paper, 70 x 50 cm. You Lead, I'll Follow is a mixed media print, part of the Postcards from the Edge: Taunus series. Okay, full disclosure: this image was shot in Obergurgl, Austria, nowhere near the Taunus. Nonetheless, it's included in this series for now. When we left the US to move overseas, it was an opportunity for me to focus full time on art. It also meant that I was leaving a good career in government consulting. In one fell swoop, my identity shifted from economic equal to financially dependent hausfrau. The adjustment was not pretty. I'm learning that you've got to take turns in relationships. Sometimes you lead, other times you follow. And money isn't the only way to share responsibility and power. Living abroad has been a great teacher in this regard. It is with pleasure that I can tell you my exhibition at Galerie Uhn is extended through March 15. New work will be hung later this week to replace the pieces that have already sold, including new large-scale watercolors on board and mixed media prints. You can read about the exhibition here. 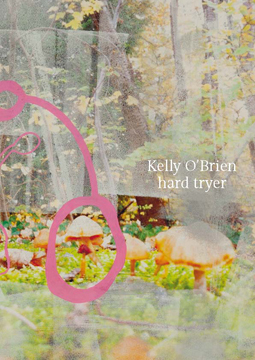 "Plenty" by Kelly O'Brien (2014). Mixed media on paper, 50 x 70 cm. Plenty is a mixed media print, part of the Postcards from the Edge: Taunus series. A common site on a hike in the Taunus is walls of stacked timber, their cut ends creating patterns of circles that line both sides of the trail. The graphic digits spray-painted across the cut logs are apparently private timber marks, indicating ownership and transportation rights for the cut timber. Like a secret formula, they add up to remind me that this is plenty. "She Decides to Shine" by Kelly O'Brien (2014). Mixed media print on paper, 50 x 70 cm. 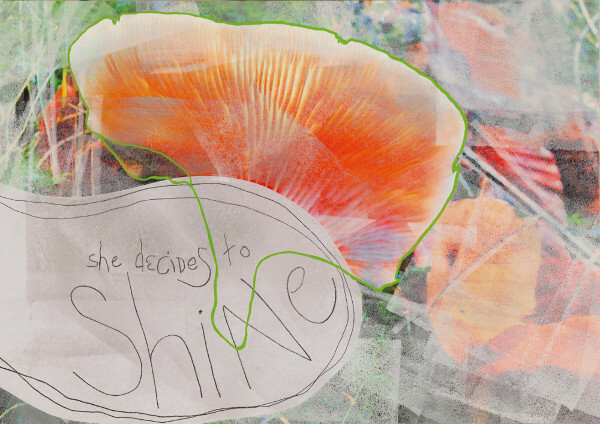 She Decides to Shine is a mixed media print, part of the Postcards from the Edge: Taunus series. Our local forest is scattered with beautiful mushrooms and fungi. Germany has some 5,000 mushroom species, including many that are considered delicacies. We have not, however, been brave enough to collect and consume them – something the locals enthusiastically do from early September to mid-October. Apparently, there's even a Mushroom Mafia. This lovely specimen was literally glowing, not to be missed. "Begin Anywhere" by Kelly O'Brien (2014). Mixed media on paper, 50 x 70 cm. Begin Anywhere is a mixed media print, part of the Postcards from the Edge: Taunus series. The Taunus is laced with hiking trails, stacks of timbered logs, and an occasional mid-hike restaurant or biergarten. Foul weather is no excuse, with the sun shining on average only 36% of the time. Rain, occasional shine, wind, snow – everyone is out in droves walking through fields and forest. Choices abound for a pleasant outing. This ode to John Cage is a mantra for when I don't know where to start – in or out of the woods. 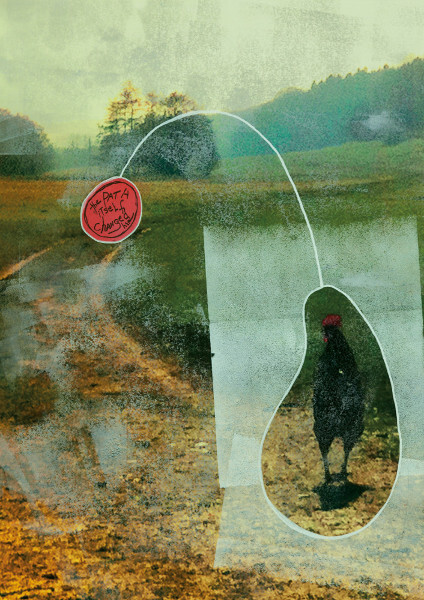 Leave Breadcrumbs is a mixed media print, part of the Postcards from the Edge: Taunus series. In a fairytale forest we hiked in fog so thick, we could barely see the trail in front of us. There's a lot of natural beauty here. I used to think that the illustrations in children's books were imaginary. But now I know that they're inspired by real-life scenery in Germany. We live about an hour from Marburg, where the Brothers Grimm studied. Art imitates life that imitates art in this neck of the woods. hard tryer at Galerie Uhn: Schnell, Like a Bunny! "Schnell Like a Bunny!" by Kelly O'Brien (2014). Mixed media on paper, 50 x 70 cm. Schnell Like a Bunny! is a mixed media print, part of the Postcards from the Edge: Taunus series. The grocery check-out line in Germany is like a competitive sport. There's a certain unspoken pressure to quickly unload your cart, bag your groceries, pay and get out of the way. Like these chocolate bunnies, you've got to be quick. Unless, of course, you're paying in cash and want to dig out exact change. Then you can take as much time as you need. "Small World" by Kelly O'Brien (2014). Mixed media on paper, 50 x 70 cm. Small World is a mixed media print, part of the Postcards from the Edge: Taunus series. I found these tiny mushrooms growing on top of an eye-level stone wall. Had I been rushing along at my usual pace, I would have missed them. But I'd slowed down to stop at the mailbox nearby to mail postcards to loved ones overseas. Up close, the scene revealed an entire small world in a patch of moss.